After your baby is born and the cord has been clamped and cut, the blood will be drawn from the cord and collected in a cord blood collection bag. Cord stem cells will be collected immediately after the drawing of cord blood. Your doctor or nurse will follow our collection protocol and place the cord stem cells in a sterile container. Sterile saline will be added to maintain the viability of the cord stem cells. All you need to do is to call StemCord’s 24-hour hotline upon your admission to the hospital or immediately after delivering your baby. StemCord will make arrangements to transport the collected cord stem cells to the laboratory for processing. The umbilical cord is placed in a sterile container with sterile saline to maintain the viability of the cord stem cells. StemCord transports the collected umbilical cord to the laboratory for processing. The umbilical cord is processed and segmented into smaller pieces. Stringent processing takes place to extract all cord stem cells prior to cryopreservation. Similar to cord blood storage, StemCord stores these stem cells in two cryo bags. Long-term cryopreservation of the two cryo bags in two locations increase treatment opportunities and gives added security. 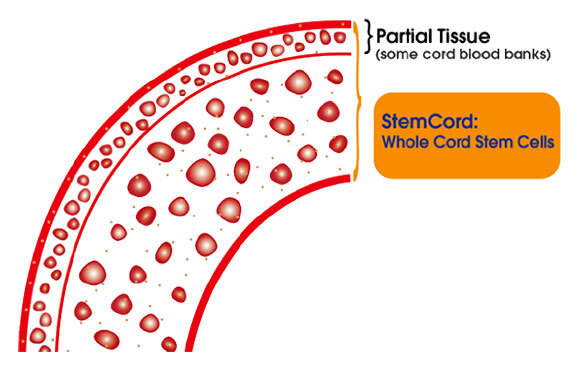 StemCord will send a report to you on the actual quantity and viability of the Cord Stem Cells. These may vary from individual. A further report may be issued when the research on the cells in the cryo vials is completed. Cord Stem Cells can be further multiplied with a culturing process in future for conditions that require larger doses of cells. SERVICE DIFFERENT FROM OTHER BANKS? Some cord blood banks simply cut the umbilical cord into smaller pieces, freeze and then store without processing. Unlike them, StemCord extracts the cord tissue stem cells before storage so that they are immediately available for treatment when needed. The MSCs can be further multiplied with a culturing process in the future. This is especially so if the therapy (for certain conditions) requires larger doses of MSCs. Research shows that extracting the stem cells before storage increases cell yield 8x more than the cell yield from frozen tissue1. In addition, while cells extracted from frozen cord tissue exhibited good functional recovery, there were poor cell recoveries, decreased plating efficiency, increased doubling times and slower growth characteristics2. 1. Briddell R, Litkenhaus F, Foertsch G, Fuhrmann A, Foster K, Falcon Girard K, Fiscus B, Boehm A, Brown M, Pettit M, Rigas Bridges A, Nichols K, Fodor W and Kraus M. Recovery of viable MSCs isolated from fresh umbilical cord tissue, measured after cryopreservation, is on average 8-fold higher when compared to recovery of viable MSCs isolated from previously cryopreserved umbilical cord tissue. Study sponsored by ViaCord. ASH Abstract submitted 2011 Aug. 11. The additional processing requires more time and effort upfront, but provides more benefits in the long run. For these reasons, StemCord extracts the stem cells from the cord tissue prior to cryopreservation for optimal results. At StemCord, our commitment to your family’s health and best interests come first. Cord stem cells comprise several different cell types and each cell type has different potential. StemCord processes stem cells from the entire cord before freezing. Want to learn more about StemCord’s cord stem cell banking services?